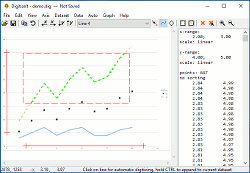 DigitizeIt - Plot Digitizer Software. Digitize graphs, charts and math data. Digitizer software - digitize a scanned graph or chart into (x,y)-data. DigitizeIt digitizer software replaces a digitizer tablet. Sometimes it is necessary to extract data values from graphs, e.g. in most scientific publications only plots but no data values are published. DigitizeIt makes it easy to actually get back numbers from such a plot! digitize it automatically or manually. Data values can be saved in CSV format or copy & pasted directly into any other application, e.g. MS Excel or Microcal Origin. DigitizeIt has been used to collect data for lots of scientific papers! Check e.g. Google Scholar for references. Please read installation and uninstallation instructions, if you need help. DigitizeIt is try-before-you-buy software. The unregistered version is for evaluation purposes only and will stop working after 21 days. If you want to continue using DigitizeIt after the evaluation period, you must purchase a license key. The license does not expire and is valid for all future updates of DigitizeIt on all supported operating systems. The online registration process is done by MyCommerce Share-it. It is easy, secure and fast. You can pay using several different payment methods and currencies. If you pay by credit card, you will receive the license key immediately after purchase. Need a quote? Prefer to order offline? Do you have questions concerning ordering, delivery or payment? You find all answers in our Customer Care Center.